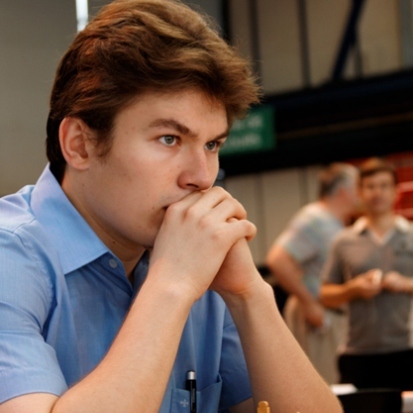 GM Evgeny Romanov is the winner of the San Salvador Chess Open 2015. He was third seeded in the tournament and scored 8 points in 9 rounds – a full point ahead of the competition. The silver medal went to top seed GM Sergei Tiviakov and second seed GM Ortiz Suarez Isan Reynaldo won the bronze medal. Both players shared the position with 7 points, along with several others, but won their place on the podium on better tie breakers. The 9-round Swiss event was organized by the Federacion Salvadoreña de Ajedrez and offered $8000 in prizes. A total of 104 players from ten countries took part in the tournament. Among them were 5 Grandmasters and 6 International Masters. Prior to the tournament, the organizers held a 20-board simultaneous exhibition with GM Evgeny Romanov.